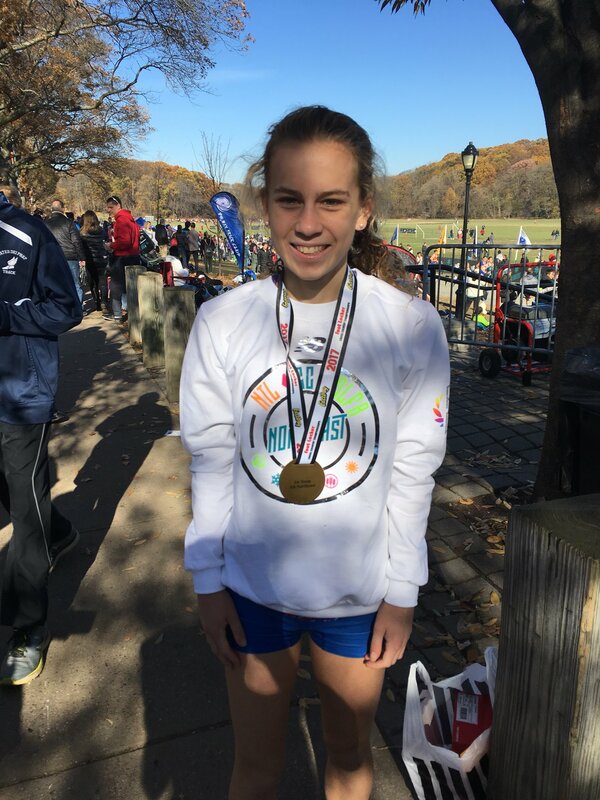 Home » NHCC » Robitaille WINS Nike Northeast Regional! Gaughan Qualifies for Second Footlocker Nats! Robitaille WINS Nike Northeast Regional! Gaughan Qualifies for Second Footlocker Nats! NXR Northeast Race Videos Below!!! A hearty congratulations to Manchester West’s Julia Robitaille as she became the first Granite Stater to win a Regional title since Hanover’s Georgia Griffin in 2007. Once again, Robitaille employed a measured strategy pulling away gradually to win by 9 seconds over second place Maggie Donahue of Wellesley, MA 18:25 to 18:34. Robitaille’s strength was on full display as she came off the hills to stay consistent over the last 800 meter flat field loop to win comfortably. BG’s Caroline Fischer capped an injury plagued season to place an impressive 10th in 19:07 while her teammate Caroline Towle was 25th (19:45). Corinne Robitaille placed 28th in 19:48 while Pinkerton’s Meghan Cross was the 5th NH finisher to place 41st in 20:06. Cross led the Trailblazers to an impressive 5th place finish as NH’s top team. Also scoring were Jordan Vaillancourt, Britney Johnson, Ciara April and Maison D’Amelio. Souhegan, led by Elise Lambert was 13th, Coe-Brown was 16th and Bishop Guertin was 18th. On the boys side, the top NH finisher was D2 State Champ Coe-Brown’s Evan Tanguay as he placed 25th in 16:50. D1 State Champ, Concord’s Forest MacKenzie placed a hard charging 31st in 16:52. MacKenzie’s teammates Matthew O’Brien, Eli Boesch Dining and Oliver Spencer rounded NH’s top 5 finishers. NH’s top team, Concord placed 13th, while Coe-Brown placed 22nd. Notably, CBNA’s Luke Tkaczyk and Wyatt Mackey were the race’s top freshmen. Considering this along with Concord’s depth coming back next year, NH boys’ future is bright! 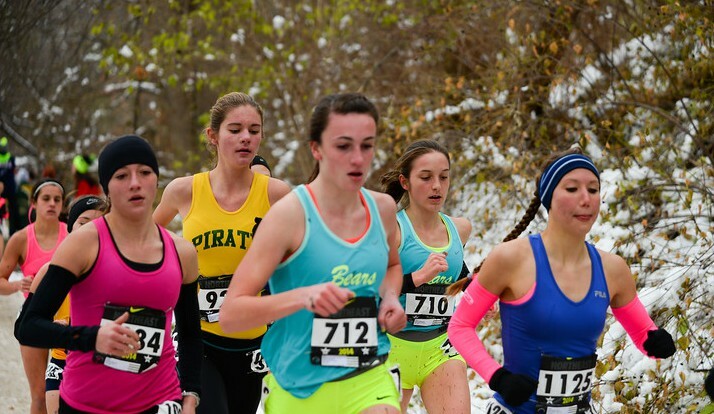 Down the Hudson in NYC, Exeter’s Jackie Gaughan made it two-in-a-row as she qualified for Footlocker Nationals by virtue of her 3rd place finish at Van Cortland Park. Showing her true pedigree, Gaughan bounced back from a disappointing New Englands to battle for the top spot in the back hills of America’s most storied course to blaze a time of 17:54 just 7 seconds out of first. The race was won by Marlee Starliper of Wellsville, PA, while second was Katherine Lee of Wading River, NJ. Milford’s Rebecca Durham continued the theme of redemption as she placed a phenomenal 12th in 18:45 after dealing with illness over the past month! Oyster River’s Danielle Slavin was NH’s 3rd top finisher placing 34th in 19:39 while Milford’s Lauren Robinson placed 47th in 20:01. On the boys side, Max Ireland placed 30th in 16:30 to be NH’s top finisher. PEA’s Will Coogan was 52nd in 16:47, while Exeter’s Jacob Winslow was 76th in 17:04. Coe-Brown Girls & OR’s Doody Qualify for Nike Cross Nationals! Previous post 2017 Northeast Regionals: What to Watch For?